The new vision and evolution towards new service platforms supporting the Digital Transformation. Companies which, like Engineering, decided to develop their own data centers, are today the only ones able to combine strategy with the elements of concreteness and speeds of implementation needed for the Digital Transformation required by all clients. Engineering D.HUB offers innovative solutions such as cloud, robotic process automation, next generation service desk with chatbots and digital agents, IoT solutions, biometric recognition, "as a service" solutions for proprietary, customers and partners vertical applications, sustaining the innovation that revolutionizes business processes and supports new digital business models. The company is already a reference point for outsourcing and IT services, thanks to the union between state-of-the-art technological standards and thorough knowledge of business processes and offers customers the guarantee of the "Mode1" IT management, supporting in parallel the “Mode2" IT evolution, with a non-intrusive methodology and alongside vision-to-performance. Engineering D.HUB has more than 850 professionals and operates through an integrated network of 4 Data Centers located in Pont-Saint-Martin, Turin, Milan and Vicenza, with a service system and infrastructure that guarantee the best technological, qualitative standards and security for more than 330 customers both nationally and internationally. High added value Information Technology services, outsourcing services and innovative services according to the Cloud Computing model are established on the data center integrated network, while the overall perimeter of services offered to a pool of more than 330 clients includes management of over 21,000 server, desktop management services for over 230,000 workstations, a network of 18,000 network apparatus, disk space of more than 10 million Giga-Bytes, more than 400 SAP requests, two million tickets per year (service requests coming from users) and more than 1,200 Wide Area Network lines. 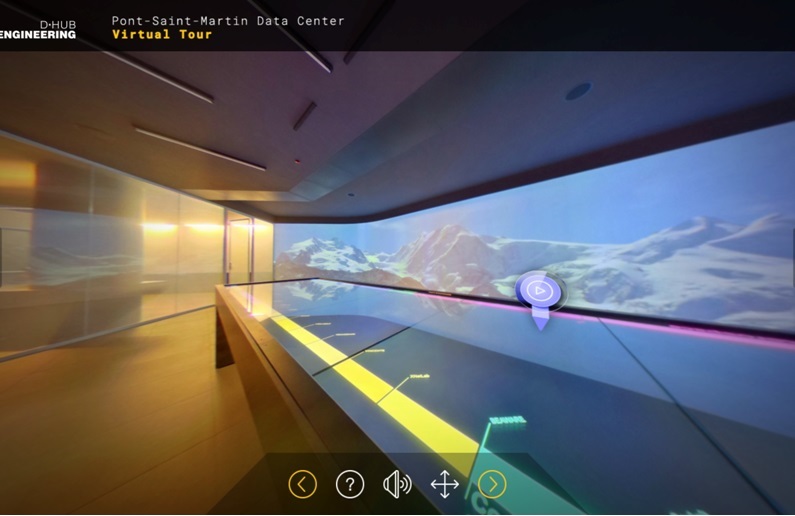 More specifically, the Pont-Saint-Martin data center uses a latest generation geothermic system that exploits the water at 13 degrees in the underlying waterbed for the cooling system. A system that allows savings of 20% of electricity and an increase in the refrigerating capacity. The project has allowed Power Usage Effectiveness of less than 1.5 to be achieved, which is a valid international standard for measurement of energy efficiency. Visit all the areas via 360° images and obtain detailed information on the technologies used to operate the entire infrastructure.